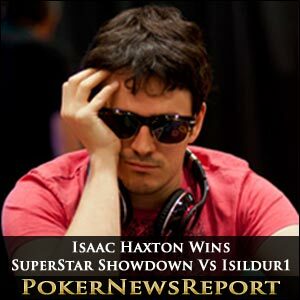 American Isaac ‘philivey2694’ Haxton has again beaten Super Swede Viktor ‘Isildur1’ Blom in the latest match-up in the SuperStar Showdown high stakes game at PokerStars. The challenge was postponed on Sunday when the American’s internet connection became unstable as Malta – where Haxton is now living – was hit by severe storms and record-breaking rainfall. But, while Haxton found himself just over $99,000 down following the 692 hands the duo managed to play before the 2,500-hand match-up was delayed, the American battled back to end this latest confrontation $5,093 ahead. That is a considerably smaller sum than the $41,701 Haxton – who was born in New York City but grew up in Syracuse – earned from the inaugural SuperStar Showdown back in December of 2010 when the stakes were set at $50 and $100. However, Haxton’s victory means Blom now has an overall record of 9-3 from the challenge matches after Canadian star Daniel Negreanu also notched a win – to the tune of $26,500 – from the seventh of the 21-year-old Scandinavian’s showdowns. This latest head-to-head was played out over four tables of No-Limit Hold’em as both competitors put up $300,000 to play, with the stakes doubled to $100 and $200. The Lizard King – which is Haxton’s nickname – did end up as the winner this time, of course, but the match could have gone either way, with both players having opportunities to snaffle the others massive bankroll. The 24-year-old quickly overcame that huge deficit to take an $80,000 lead, although Blom most certainly wasn’t beaten just yet as he evened up the challenge just ahead of the closing hands when finding a full house to defeat Haxton’s flush. Even then, it appeared as though a significant winner would emerge when both moved all-in not long after, only to discover that they both held K-10 and full houses to ensure that the deadlock continued. Both attempted to deliver the knockout blow, but ultimately Haxton was only able to take a slight advantage as the 2,500th hand was played out. While all poker fans will be eager to see Blom and Haxton go at it again – for a third time – in the near future, the super Swede is scheduled to play his 13th SuperStar Showdown at PokerStars this coming Sunday at 16:00 GMT (Greenwich Mean Time) against English high stakes No-Limit Hold’em specialist Alexander ‘Kanu7’ Millar. With Blom’s match against Haxton only finishing yesterday, though, that date is not definite, so bookmark Poker News Report for any and all updates.